Andreas "Andy" Brehme (born 9 November 1960 in Hamburg) is a German football coach and former football defender. He is best known for scoring the winning goal for Germany in the 1990 FIFA World Cup Final against Argentina on a 85th minute penalty kick. He is considered to be one of the greatest free-kick takers and crossers of all time. 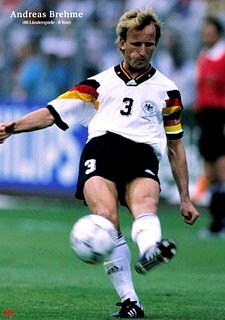 Brehme's special skill was the fact that he was one of the few players in the world who could play with both feet equally well, making him very valuable as an outfield player. He was well known for taking penalties (although not exclusively) with his right foot and taking free kicks and corners with his left foot. It's believed that Brehme felt his right foot was more accurate than his left, but his left was harder. This is shown when in 1990, Brehme placed spot kick was taken with his right, but four years earlier in 1986 Brehme scored in the quarter final penalty shootout against Mexico, with a left foot piledriver. Neither he nor the German national team had any success in the European championship held just months after Brehme’s debut. The first round knock-out was not accepted and when Beckenbauer rebuilt his team for the Mexico World Cup in 1986, Brehme was one of his safest cards. Andreas was instrumental in the latter stages of the tournament scoring a goal in the semifinal against France and his two corner kicks in the final against Argentina, lead to two goals, although the South Americans won 3-2 in the end. Brehme was tempted to try his luck in the Italian league and joined Inter Milan along with his German teammates Klinsmann and Matthäus. He won the Serie A in 1989 and a year later he won the World Cup with West Germany playing several of the matches in his home stadium, the San Siro. Brehme scored three goals including the match winning penalty in the final against Argentina five minutes from time to revenge the defeat of four years earlier.